I was shocked to learn that John Coleman passed away last night. He was 83. 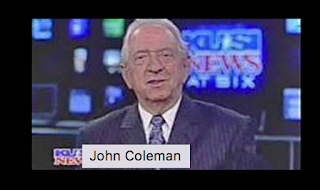 John revolutionized television weather with his Good Morning America reports where he creatively used chroma-key and actually gave highly accurate and comprehensive weather as opposed to the "feel good" weather on Today. He also fought some of the same battles I was fighting with the NWS at the time. The most prominent was the release real-time weather satellite photos. Looking back, it was absurd -- but the NWS was concerned that releasing real-time weather satellite images would cause some imaginary harm. With John's national clout, we solved that problem. I first got to know John when I was working at KTVI and he came to town to do GMA. He operated out of my weather department for several days and we quickly became friends. I saw him from time to time even after I moved back to Wichita. I also appreciated, in recent years, his calming influence when it came to global warming zealotry. John was the founder of The Weather Channel. He was forced out and the meteorological quality was never the same. He spent the final years of his career in San Diego and retired in 2014.